Our private driver will pick you up from your hotel at 5am, and then transfer you to the airport. After flying to Xian, you will visit the well-known Terracotta Warriors; you will be shocked by the magnificent underground stone warriors. 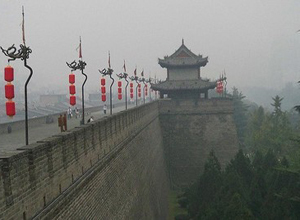 Next we will visit Xian City Wall, the most complete wall in ancient China. At last we will come to the Big Wild Goose Pagoda, where we can overlook the whole Xian City. After the tour you will be transferred to the airport and then go back to Shanghai by flight. We will pick you up in time from Shanghai airport to your hotel. The driver will pick you up from the hotel at 5am, and then transfer you to airport. 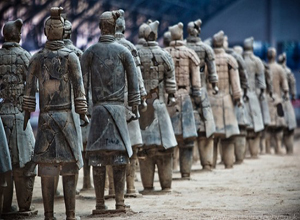 After flying to Xian, your private driver and guide will accompany you to visit the grand Terracotta Warriors; and then we will go to the old Xian City Wall, it is sited in the center of Xian City ; the last one is the Great Mosque which was built in the Tang dynasty. After the tour, transfer back to airport and fly back to Shanghai. Pick you up in time at Shanghai airport and transfer to your hotel. End of our service. Pick you up from Xian train station. 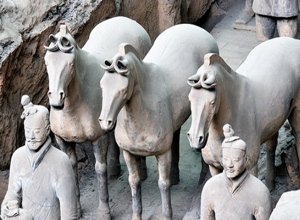 The first attraction we visit is the must-see Terracotta Warriors, where you can see numbers of stone warriors and horses which protect the dead Emperor Qinshihuang. The next visit is at the Xian City Wall which has long history and intact structure. Our visit will end at the Big Goose Pagoda; there is the biggest music spring at the north square in Asia. After the tour, the private driver will transfer you back to airport. You will be picked up in time at Shanghai airport and transferred to your hotel. End of our service. Pick you up from your hotel by our private English-speaking tour guide and driver at 17:30, Transfer you to Shanghai train station and take an overnight soft sleeper train to Xian. Pick you up from Xian train station. The first scenery spot we visit is the famous must-see Terracotta Warriors; then we will go to the Xian City Wall, which has thousands of history and is still well preserved now. The next one is Banpo Museum. Here you can feel the prosperity of living and production in the remote matriarchal clan society over six thousand years ago. The last station is the neighbored Bell & Drum Tower. They were used to tell time in the ancient times. After the tour, transfer back to airport and fly back to Shanghai. Pick you up in time at Shanghai airport and transfer to your hotel. End of our service. Airport pickup by our English-speaking guide, who will wait at the arrival hall, holding your name sign for you to recognize. Start your Shanghai tour with the Yuyuan Garden. The garden was the private garden of a high-rank Ming Dynasty offical’s. It is one of the best Chinese classic gardens with elegant garden settings. Continue our exploration in the modern city. First ascend the landmark skycraper-Shanghai World Financial Center to have a panorama of Shanghai. Move on the Shanghai Museum, said to be the best museums in China, which displays well Chinese history and civilization. After lunch, come to the Nanjing Road for shopping fun. The road enjoys the fame as the No.1 commerical street in China. Then head to the Bund for a pleasant stroll. You will be impressed by the different style foreign buildings that was built during the city’s colonial period. Hotel to Shanghai airport transfer; fly to Xian. Upon arrival, airport pickup by local Xian guide. Xian is a distinct city from Shanghai. It is ancient and cultural. We would first witness the Terracotta Warriors and Horses, the ‘underground army’ consisted of life-size soldiers is so impressive! 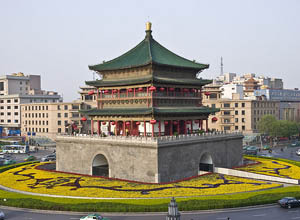 Then back to downtown to visit the other two Xian landmark attractions-the Big Wild Goose Pagoda, a beautiful Buddhist architecture, and the City Wall, which represent one of the oldest and best preserved Chinese city walls. After the tour, send you off at the Xian airport for departure. End of service. Welcome to this vibrant city-Shanghai. Our English-speaking guide will pick you up at the arrival hall of the airport and transfer to hotel. Today let’s see the modern part of Shanghai. 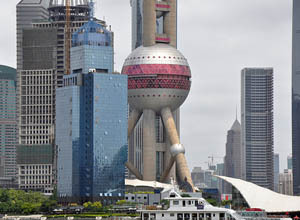 Shanghai Oriental Pearl TV Tower is one of the tallest buildings in the world. Shanghai Urban Planning Exhibition Hall gives an insight into Shanghai’s future with great displays. The Bund is an ideal place for a pleasant stroll to appreciate different foreign style buildings built in the city’s colonial period. Besides its modernness, Shanghai has its old cultural side. 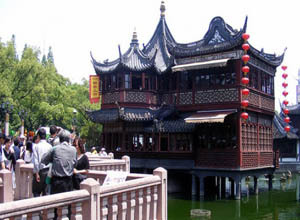 We will first visit the Yu Garden, a beautiful private garden built in the Ming Dynasty. Then move on to the Jade Buddha Temple, which is very popular among Shanghainese and famous for the two Jade Buddha imported from Burma. Head to the City God Temple area. 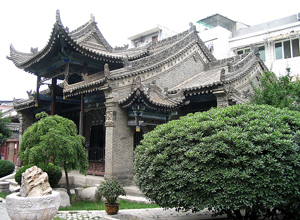 It is a Taoist temple and is most famous for the shopping market around. After the tour, be transfered to airport and fly to Xian. Upon arrival, airport to hotel transfer in Xian. In Xian, you can trace China’s ancient time. Start our sightseeing in Shaanxi History Museum, one of the four best national museums of China with great displays of Chinese civilization. 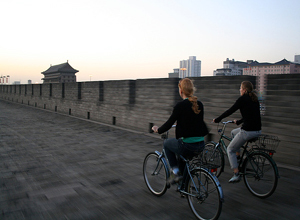 Ascend the ancient City Wall and have a pleasant stroll or pay extra cost to cycle on it. Finally, visit the simbol of China-Bell Tower. 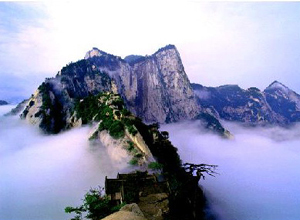 It is one of the grandest of its kind in China. 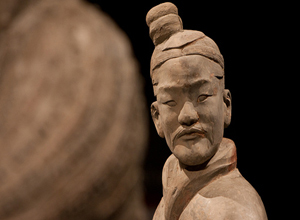 Today we will witness the world wonder-Terracotta Warriors. Then come to the Big Wild Goose Pagoda, a beautiful Buddhist building, exellent for photo fun. 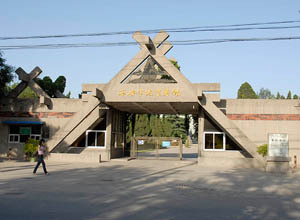 Transfer to the Xian Stele Forest Museum. 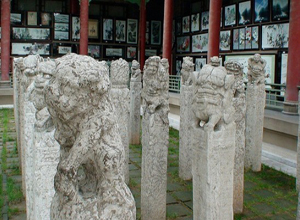 The Museum houses a large collection of the earliest stone steles and sculptures of different dynasties. Send you off at Xian airport to fly to your next destination. End of our service. Our private English-speaking guide and driver will pick you up in time at Shanghai airport and transfer you safely to the hotel. A paper board with the sign of your name will be held high at the airport exit. Begin our journey in this international metropolis. First, visit Oriental Pearl TV Tower, the third tallest TV and radio tower in the world. 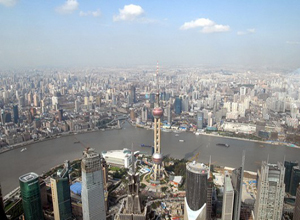 It is the best place to have a birds-eye-view of Shanghai City. 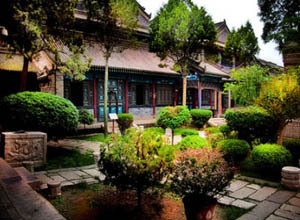 Move on to the Yu Garden, which is a private Ming Dynasty garden with beautiful sceney and delicate layout. 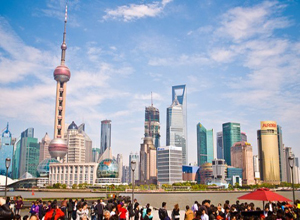 Then go to the waterfront to visit the Bund, where you could see the old past of Shanghai by the impressive foreign buildings of the city’s colonial period. Stoll to the nearby famous shopping street-Nanjing Road. Continue our sightseeing in Shanghai. We will visit Shanghai Museum, a first-rate national museum which is a quick way to learn about Chinese civilization. The Jade Buddha Temple is a peaceful refuge from the modern bustle of Shanghai. 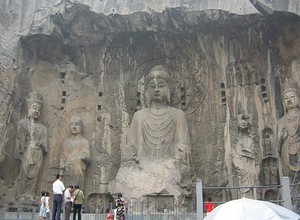 It is famous for the two jade Buddha statues imported from Burma. The Shanghai Urban Planning Exhibition Center displays the urban planning and development with a stunning large-scale model of Shanghai. Finally, we go to Xintiandi. As an affluent car-free sopping, eating and entertainment district of Shanghai, Xintiandi is composed of an area of reconstituted traditional stone houses on narrow alleys. Hotel to airport transfer; fly to Xian. 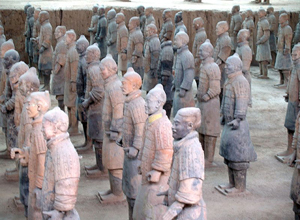 Airport pickup by our local Xian guide and drive to the most famous Terracotta Warriors and Horses. It is so impressive to see the life-size ‘underground army’. Then head for the Forest of Stone Steles Museum. With over 900 years of history, the site holds a large collection of the earliest stone steles and sculptures of different dynasties. Let’s explore this ancient capital city. 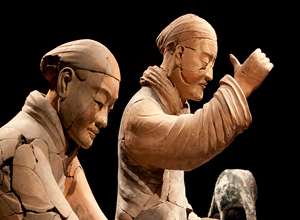 First, come to the Shaanxi History Museum, another famed national museum in China. Then stand on the top of the City Wall to have a panorama of the city. You could also choose to cycle on the wall (self pay). 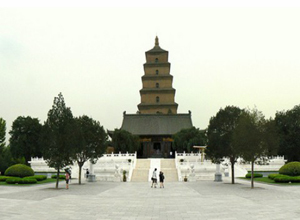 Head for the Big Wild Goose Pagoda, a elegant Buddhist architecture, symbol of Xian. Our last stop is Great Mosque, the oldest in China with traditional Chinese building style. After breakfast, be transferred to railway to catch the high-speed train to Luoyang to visit the two world famous sights-Longmen Grottoes and Shaolin Temple. 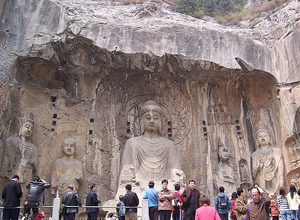 The Longmen Grottoes is one of the three largest grottoes and regarded as the most famous treasure houses of stone inscriptions in China. The scenery measures 1,000 metres from north to south where there are over 2,300 holes and niches, 2,800 steles, 40 dagobas, 1,300 caves and 100,000 statues.The Shaolin Temple is the birthplace of Chinese Shaolin Kungfu. 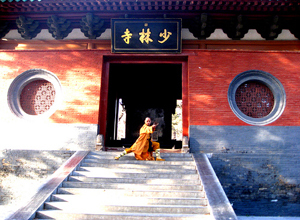 You will enjoy the real Kung fu performance by the monks, and visit the Fabulous Hall of Heavenly Kings, Pagoda Forest and other sites in this old massive temple. Free time before being transferred to airport for departure. Thanks for using our service. *Entry Shanghai and exit Luoyang flights. Shanghai airport pickup by our private guide and driver and transfer to hotel. Our guide will hold your name sign for you to recognize at the arrival hall of the airport. First, visit the Shanghai Museum, a first rate museum in China. It stores 120,000 precious culture artifacts, which narrate a story of China’s 5,000- year civilization. Then come to the Shanghai World Financial Center. At 1,555 ft high, the top observation deck gives an amzing panorama of the city and many of its main attractions. Move on to the Bund area to visit the Nanjing Road and the Bund. 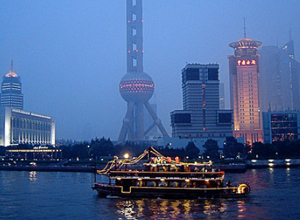 The Bund is a famous waterfront and regarded as the symbol of Shanghai for hundreds of years. 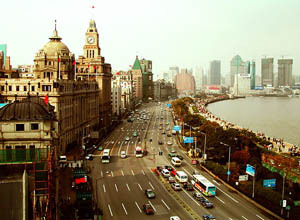 It is the starting point where Shanghai walked into the modern times and a good place to know about the old Shanghai. The Nanjing Road, 3.4 miles long, a must-see destination attracting thousands of fashion-seeking shoppers from all over the world. Today we will trace by Shanghai’s old past. Yuyuan Garden is a famous classical garden in Shanghai, built in 1577 of the Ming Dynasty. The pavilions, halls, rockeries, ponds and cloisters all have unique characteristics. In the modern city, there is a venerable and famous old Buddhist temple-Jade Buddha Temple, famous for the two jade Buddha statues brought from Burma. Xintiandi a car-free shopping, dining and entertainment area of Shanghai. It is typical for the houses transformed from traditional Shanghai Shikumen buildings. Hotel pickup and drive to Suzhou, a famous city for its beauty. We will first take a rickshaw ride through the old streets & Hutongs of the city to see local people’s life. Then visit one of the city’s representative Chinese gardens – Humble Administrator’s Garden. 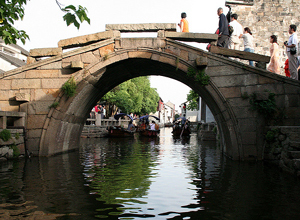 In the afternoon, visit the ancient Zhouzhuang Water Town, which enjoys the reputation of the ‘oriental venice’. Transfer back to Shanghai after the tour. Hotel to airport transfer; fly to Xian. Upon arrival, be met by our local Xian guide at the airport. Visit Xian City Wall, It is one of the largest ancient military defensive systems in the world. 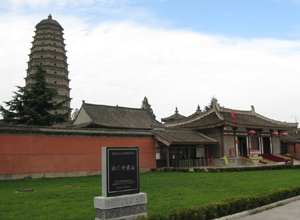 Then head for the Big Wild Goose Pagoda, a symbol of the old-line Xian, a well-preserved Buddhist architecture. Be sent to hotel after the tour. Today we will witness the great Terra cotta Warriors and Horses. These 6000 life-size painted terracotta warrior and horses were sculptured 2,200 years ago to protect the tomb of China’s first emperor-Qinshihuang. After lunch, transfer back downtown for sightseeing. Come to the Shaanxi Historical Museum. The museum houses the best cultural heritage of Shaanxi Province and shows the systematic development process of Chinese civilization. Then visit the Great Mosque, one of the oldest, largest and best-preserved Islamic mosques in China, built in 742 during the Tang Dynasty.